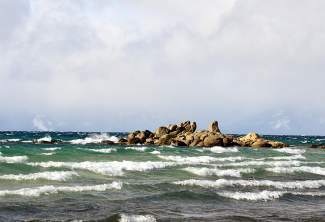 Lake Tahoe is seen amid windy skies on Dec. 22 from the East Shore. According to the Tahoe Prosperity Center, local residents also feel turbulence when attempting to make a living here. LAKE TAHOE — Each year the Lake Tahoe Basin receives an estimated 3 to 5 million visitors who account for roughly $2 billion in tourism revenue. One might think that visitation would be enough to sustain a vibrant local community. The reality beyond the eyes of the visitor who comes for the pristine waters and seemingly endless forest, however, is a very different Tahoe — the locals’ Tahoe. While there is access to trails, ski terrain and lake recreation near most any resident’s doorstep, successfully making a living in the region is a different issue. “It’s a pretty challenging place to do business,” said Lake Tahoe South Shore Chamber of Commerce president B Gorman on Wednesday, Dec. 16. Away from tourist areas and off the highway, the locals’ Tahoe is one struggling with underpaying employment opportunities, challenging housing conditions, blighted residences and aging infrastructure. With some residents resorting to living in old motel rooms converted into long-term housing, it’s a pressing concern. According to a recent report from the Tahoe Prosperity Center, a nonprofit organization formed to collectively address the economic needs of the Tahoe Basin, the region has a greater income-to-housing-cost disparity than even San Francisco — a metropolitan region commonly associated with a high cost of living. 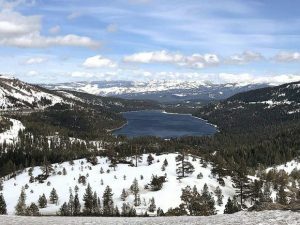 The organization’s report indicates the Tahoe region’s average-household-income-to-home-value ratio is 10 to 1, meaning average home cost is roughly 10 times higher than average annual wages. San Francisco, by comparison, is 8 to 1. Jesse Walker, an economics consultant who worked on the prosperity center’s report, said 3 to 1 is considered a more desirable, affordable ratio that exists in other parts of the country. The reason for such a discrepancy can be credited to low per-capita income. For example, the report says the average annual income for a South Lake Tahoe resident is below $25,000. Basin-wide, that average is in the low 30s to high 20s, while the median single-family-home price is closer to $500,000. In addition to housing and income concerns, the prosperity center’s report also addresses a host of other regional economic issues, including employment, declining population, tourism and business trends. “I think the most surprising (thing) is that our affordability factor is higher than San Francisco,” Drum said of the 66-page report. In an effort to address some of the report’s concerns, members of the Tahoe Prosperity Center presented information from their comprehensive report to interested community members at the city of South Lake Tahoe’s monthly Tahoe Talks Brown Bag Lunch Series last Wednesday, Dec. 16, at Lake Tahoe Community College. The prevailing theme from the meeting was that something needs to be done. Just what that something may be, however, was less than clear. Presenters and community members suggested drawing better employment opportunities to the region, and expressed a need for better infrastructure like high-speed Internet in order to be able to do so. In terms of housing, a number of those in attendance suggested a need for change in rigid policies related to land use and hotel room allotments. “We have to be way more creative as far as how we think of housing,” longtime local and tourism industry consultant Carl Ribaudo said during the meeting. Ribaudo and others suggested that existing state, county and local government policies are among the biggest factors in delaying progress. One other person in attendance suggested state and federal government level entities may not even be aware of a need to address the issue, since from an outside perspective Tahoe may be viewed as a thriving tourism region. Ribaudo also suggested a need for a changing of the guard in terms of longtime local thinking and leadership. “The anti-change mentality is very much a problem,” he said. He and others with the prosperity center said there is a need for more residents to become involved. Ribaudo, Drum and Walker each acknowledged the potential for change remains, and recent projects like recreation path expansions at the South Shore, the South Lake Tahoe Loop Road proposal, and the Tahoe City highway realignment projects could be steps in the right direction to help promote a healthier economy. 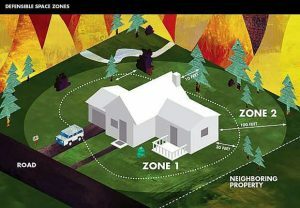 The full report is available on the group’s website, http://www.tahoeprosperity.org.